About 12% of the ramps have been installed on sidewalks that are impassable due to the city’s decay. Thanks, Bob Dole. Your contribution to American society will long be remembered. That’s Big Government for you. It breaks both your legs and then forces you to buy someone else a crutch. See here for plenty more of Detroit’s handicapped-accessible sidewalks to nowhere. On tips from Rob E.
Lemme see……Accessible sidewalks are federal law, therefore them must be constructed regardless of the cost of the need. It is against Federal Law to sell or use marijuana, yet state after state has approved its buying and selling, and the Federal Government ignores that lawlessness in those states (while continuing to enforce it in other states). So why did you use a file photo of Haiti? Maybe the DEA was ordered to stand-down during the reign of Obamic Desolation. Wish Hinckley could have said that. Pretty funny but still not as funny as the ADA mandated braille instructions on the side of DRIVEUP ATM’s. Now THAT’s funny. Which enumerated power in the Constitution is that sidewalk mandate authority contained in again? I forget. At a state campground in Massachusetts, they installed handicap access bathrooms. But in order to actually GET to the bathrooms you had to walk through the woods on a narrow, tree-root laden path. Yup, makes sense to me! Detroit is demonstrating almost in real time that the earth is perfectly capable of undoing whatever Man can throw at it. The grass and trees are literally consuming the concrete and all signs of the civilization that once defined Detroit. And in a very few years. Throw in a few more harsh winters with their freeze/thaw/heaving cycles and it’ll all be rubble in short order. Man can’t kill the earth, even if he tried. That would be right after the “good and plenty” provision. Those sidewalk ramps are a perfect example of Homo Obstructus in action. HO is a breed of human whose survival trait is to get in the way of others, and thus prevent them from doing what they need to do to survive. For example, an HO will find the narrowest point in any flow of traffic, and stop right there. Say you’re in a hallway with a trash barrel tucked up against one wall. The HO will pick that narrow spot to stop and check email, or have a conversation with someone else. 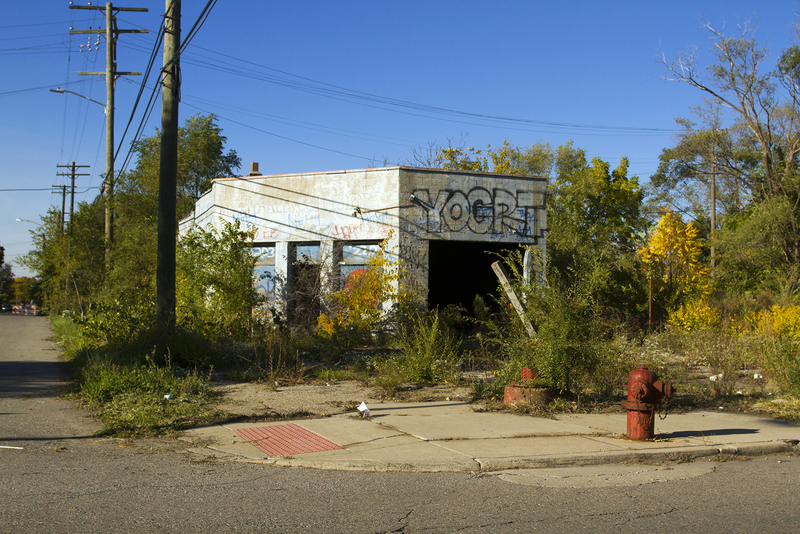 Detroit may be dead, but it still votes Democrat. Oh, the wonders of central planning.